It is a new year! The turning of the calendar means we get to look back to the previous year and celebrate all that was accomplished and make lists for the new year about all we want to accomplish. At this time of year, Janus, the Roman god with two faces, always comes to mind. One of his faces is looking back and the other is looking forward. He keeps watch over doorways, thresholds, boundary crossings, transitions, beginnings, and endings. While it may be a false etymology to think that January is derived from his name, his image is a convenient icon to mark the passage of the year. A few weeks ago, I ran across a story about a very old shark that resonated with me and I want to share it with you. This particular shark was said to be slightly over five hundred years old. Of the several articles, one went a little deeper into actual science (because yes, I admit that I succumbed to the “click bait” and read more than one article on the subject). The more fact-entrenched article indicated that in a study of a group of 28 female Greenland sharks, researchers analyzed eye tissue and found an age range of 272 years up to 512 years. More clicked links delved into the science of what it means to analyze eye tissue and the margin of error in calculating age, but you can discover that on your own if you wish. Greenland sharks can grow to 24 feet long and weigh in at over 2,500 pounds. They live in very cold water and are usually at depths of over a mile. These sharks are extremely slow moving and swim at a rate of about a mile per hour with a top speed of less than two miles per hour. It got me thinking about what events throughout history a Methuselah like this would have lived through from the 16th century to now: the Ottoman Empire, Galileo, the age of enlightenment, French and American revolutions, industrialization, lunar landings, Steve Jobs, globalization, the internet, just to name tips of some of the most massive icebergs in our history and society. But, this is the look back and only half of the Janus model. What comes next for a shark like this? The reality is that while our shark friend might have been alive during momentous occasions in history, she was probably more concerned about her next meal than what the humans were up to. She is an example of something that was built to last and if the measure of sustainability is simple existence, then nature has perfected it for her. But if the measure of sustainability is relevance in the world and making a difference, then I’m not sure how to measure her success. Do you know the Rip Van Winkle story popularized by DesignShare (about a decade ago)? Rip wakes up in the 21st century and he marvels at what he sees. “Men and women dash about talking to small metal devices pinned to their ears . . . older folk defy death and disability with metronomes in their chests and with hips made of metal and plastic . . . airports, hospitals, shopping malls – every place Rip goes just baffles him.” You can predict where he goes next: into a school. There, he recognizes the place immediately and exclaims, “This is a school. We used to have these back in 1907 only the blackboards are now white.” Funny. Although I bet Rip didn’t go into many independent schools like yours where things do look quite a bit different. Learning and laughing still take place and the relationships throughout your community are as strong as ever. But, there are new tools in use and these tools have liberated us from being the sage on the stage and helped us hone our skills in pedagogy and in focusing on the needs of the unique learner. The transition from the first to the second semester breathes new life into students, faculty, staff, and your community and allows a new start midway through the year. Sometimes it is important to imagine what we want the future to look like and sometimes it is important to plan for how we will make that future happen. We have our own new things cooking at MISBO: a calendar filled with relevant webinars and On the Road meetings; two summer workshops: one for the business office team to work together more effectively and help others in the school work better with you, and a second on profound changes in hiring practices and philosophies in independent schools; a fall conference dedicated to moving from questions to solutions which will be keynoted by one of the big thinkers in independent education today, Ian Symmonds. We will be at NBOA in Nashville in March and hope to see you there, especially at the MISBO reception jointly hosted with our friends from other associations around the country. Also on the horizon for MISBO is a new look and feel to our website that will allow you to get to the answers you need more quickly, revised list-servs that will allow you to connect with others and rely on the shared wisdom of a community deeply dedicated to lending a helping hand, and a renewed emphasis on your ownership of the purchasing consortium. 2018 is going to be great and who knows, maybe we will find a way to teach an old shark new tricks. 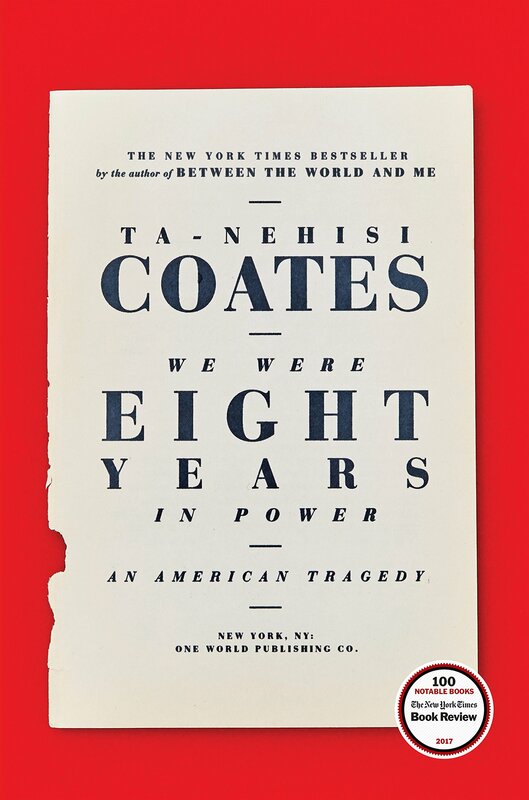 We Were Eight Years in Power, by Ta-Nehisi Coates. An important collection of essays on race in the U.S.